We would thoroughly recommend Maria. Booking was a breeze. Maria met us as planned, took us for tapas then onto a flamenco show which she impromptu took part in. What a treat for us. Being a dancer herself Maria was very knowledgable about flamenco but she also told us all about the history of Seville. We had a wonderful evening with Maria and we would definitely love to organise another tour with her in the future. Thank you Maria for a truly memorable evening. TOUR GUIDE RESPONSE: You're welcome Rachel. Hope to see you again! 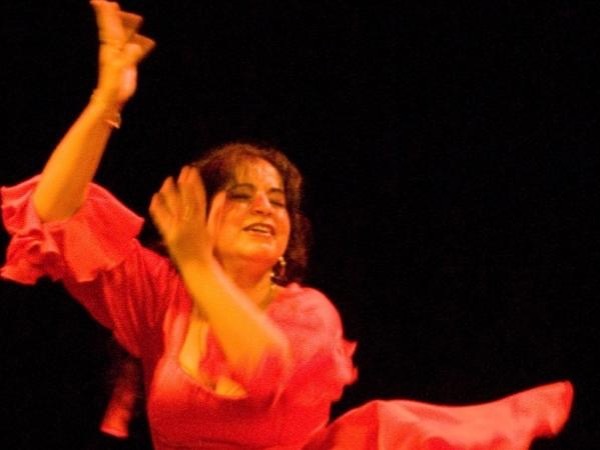 Maria is a sincere, dedicated dancer/teacher of the flamenco genre. Tapas and drinks she explained the origins and culture of flamenco. Later, in an intimate stting with 30+spectators, she and her troupe of two dancers, one singer and one guitarist put on a performance lasting somewhat over an hour. High matks to all for enthusiasm, fun and great learning experience. Maria is a very good teacher who gave us a great insight into flamenco. We asked for the harder routine and she did a wonderful job of going through footwork, rhythm and hands. She worked well with us adults and both our children. She explained the relationship between the dancer, singer and the guitarist and how they communicate. We went to see a flamenco show later that week and we could identify quite a few elements of flamenco, solely based on what we had learned with her. Highly recommend her! TOUR GUIDE RESPONSE: Dear Hazem It was lovely having you and your crew! Hope to see you again sometime. If you want to learn flamenco, this is the tour. Maria loves it and it shows. Loved our day with Maria gaining more knowledge of Flamenco. This tour was very enjoyable as we felt this was an experience as a local. It was fun shopping and cooking with Maria at her apartment and a very relaxed atmosphere as we learned about the history of flamenco as we shared our paella. A flamenco dance lesson was on my list of "Must Do" while in Seville so I was very happy that we were able to do this with Maria followed by watching her dance in a show and then enjoying tapas, what a great day! A very interesting and enjoyable evening. Maria explained the background and chose a very exciting Performance. TOUR GUIDE RESPONSE: Thank you Diane. It is really a pleasure to hear this from someone who has seen lots of flamenco before. The Flamenco Experience with Maria is unique, and for people who want to more deeply understand the culture of Sevilla and the roots of Flamenco. We enjoyed discussing the origins of Flamenco, then learning some fundamentals of movement, before seeing a performance by some artists Maria knows. A terrific evening. Highly recommend. TOUR GUIDE RESPONSE: Hello Eric and Pam. It was lovely having you and seeing how much fun you both had and how interested you were. Hope to meet again. Wow, this was the highlight of my trip to Spain! Maria was such fun to learn from - she's an expert not only on teaching Flamenco, but on the history of Flamenco. Maria will make sure you enjoy a curated Flamenco event - you'll skip the tourist locations and instead enjoy a local show the way Flamenco was meant to be seen. I really cannot recommend this enough. Excellent explanations and history of flamenco, with an amazing personal dance class followed by an intimate jam session in a Triana bar. The Flamenco Experience was such a unique and awesome way to spend a night immersing yourself into the Seville culture. Maria was a great guide as she met us early to tell us about the history of Flamenco dancing over a cup of coffee and then took us to her studio to begin our one hour intro lesson (with a singer and guitarist). I am not a very good dancer so she designed a fun lesson for us beginners which gave us the exact experience we wanted. After we went to an authentic show to top the night off. Our family had a wonderful flamenco class with Maria! We met up with Maria at a cafe near her studio where we learned a bit about the history of flamenco and then walked to her home studio where we learned some basic steps and danced ... a great way to learn about the culture in Sevilla with kids... ours were 8 and 10. Maria is talented, funny, warm and a great dancer! absolutely super.the beauty of it is that i ended up in a private studio with a real flamenco singer and a guitarist and a professional passionate dancer. so in addition to the brief history of flamenco initially introduced by Maria i ended up on stage learning and dancing flamenco.this set me for the mood indeed. afterward we went to a local theater picked by Maria, and it was the best flamenco show i ever seen in my life..outstanding performance! highly recommended. TOUR GUIDE RESPONSE: Hello Elias. It was lovely having you and introducing you to flamenco. I had a very good time too!